The most fundamental pillar of a functioning team is trust. If there is a lack of trust within a team, then it is impossible to have a well-performing team. But if you, as a team member, trust your team, then you don´t have a problem to admit a mistake, when you made one. People in a trusting team admit weaknesses. They also ask for help, if they need it. If you don´t trust your team members, then you probably are also not going to ask them for help. And you may end-up with wasting a lot of time on a simple task, which you might have solved easily with just a little bit of help from another team member. In trusting teams the team members also look forward to meetings and other opportunities to work as a group. And this is great for a healthy team. The second level of team dysfunction is fear of conflict – for example if team members are afraid to openly express their opinion, because it might end-up in a serious conflict. Healthy conflicts are very important, because they help the team to progress and improve. It is better to have healthy conflicts instead of artificial harmony in a team. But on the other side, in the worst cases the conflicts can also end-up in mean personal attacks. Therefore the key is to have an environment, which is somewhere in between artificial harmony and mean personal attacks. The third level of team dysfunctions is lack of commitment. True commitment is about getting buy-in when all the team members don´t agree. For example, if the team manager takes team-related decisions without discussing it in the team, then people might not agree with that – there is a lack of commitment for the decision. On the other hand, if the topic is discussed within the team, everything is clarified and assumptions are removed, then it is easier to come to a common decision, which everybody supports. An indicator of teams with lack of commitment is revisiting the same topics over and over again. 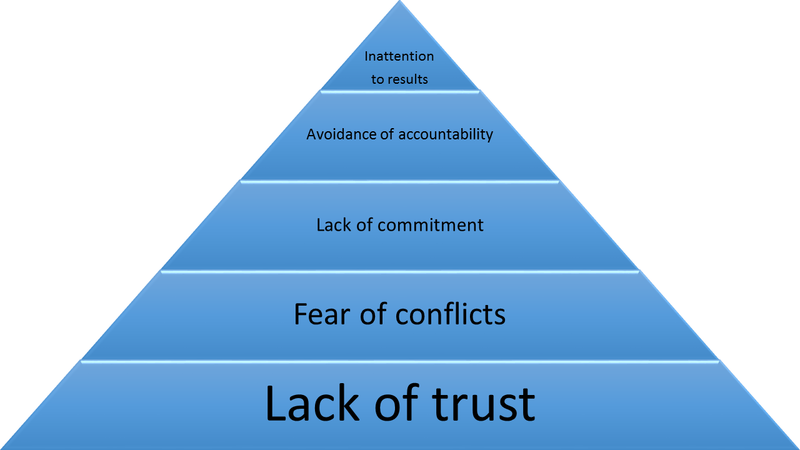 The fourth level of team dysfunctions is avoidance of accountability. Accountability is the willingness of team members to remind each other when they are not living up to whatever standards have been agreed upon by the group. For example, if a team member constantly arrives late at the office and nobody in the team feels responsible to tell him, then at a certain point other team members will start to do the same thing. They will think “Why should I bother to be there earlier, if it is more convenient for me and nobody complains from the group when I´m late?” This lowers of course the standards of the group. On the other hand, if the team constantly reminds each other about the agreed standards, only then the team is able to keep this standards. The fifth and last level of team dysfunctions is inattention to results. This dysfunction is caused by team members focusing on their personal success over their teams success – instead they should put the success of the team over their personal ego. The team should be focusing on delivering measurable results – this helps to keep focusing on the success of the project and avoids distractions. Have an open discussion with your team to avoid these 5 key dysfunctions.